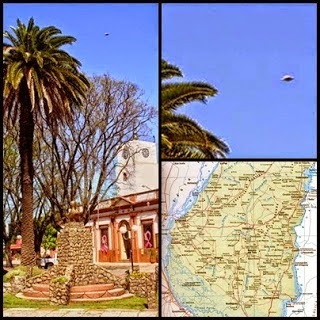 Inexplicata reports that amateur photographer captures a strange object in the sky over Plaza Libertad in the community of Entre Rios Province, Argentina. A strange object can be seen in an image captured, Monday, Oct. 21 at Plaza Libertad in Rosario del Tala. Some believe it may be a UFO. Journalist Ivan Rodríguez, a native of Rosario del Tala and a fan of photography for some years, took some photos of the Libertad gardens in the locality, but he was truly surprised when he downloaded the images to his computer. Apparently the photo was analyzed by experts and it has been deemed a genuine UFO.